First Blood ran credits to Dan Hill’s melancholic “It’s a Long Road,” a tribute to Vietnam veterans who felt distanced when they returned home. By the time of Rambo III, the melody was perverted into a powerhouse John Rambo theme, set to explosions, helicopter raids, and machine gun fire. This series fell fast. 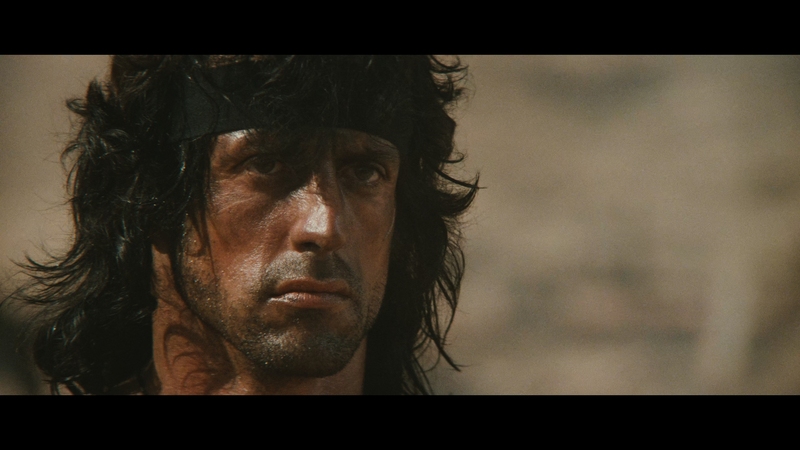 Rambo III is so removed from its predecessors, it’s hardly part of the same series. Mere figments remain. By 1988, with an animated series on the air and videogame on store shelves, the trilogy-making sequel morphed into this bombastic idiocy that sees Rambo (Sylvester Stallone) and Sam Trautman (Richard Crenna) staring down an entire Russian army without taking a bullet. Then Rambo rams a helicopter with a stolen tank. Of course he does. Of its time, the Vietnam war too redundant a topic for three straight movies, Rambo III resets things in Afghanistan. Minus the action movie quips, comic punch lines, and Russians exploding when strapped to hand grenades, Rambo III sounds an alarm – it’s a political plea to help the tenacious Afghani in a fight to keep their land. Rambo’s there to rescue his mentor as much as to prevent another country from being trapped in another Vietnam. Maybe it worked. A few weeks before Rambo III prints shipped to theaters, in the real world, Russia pulled out of Afghanistan. Things changed in the region since, leaving Rambo III a cultural relic. It needs the bevy of swirling desert fireballs to cover the moronic, self-parodying action. The Cold War, apparently not solved by Stallone in Rocky IV, still seeped into popular cinema. Here it’s a gravely Russian Colonel Zaysen (Marc de Jonge), standing idly by as his minions torture and abuse locals – Trautman included. There’s no character; Zaysen exists as something for the audience to hate, to respond to, in-between cheers for an all-American hero. Rambo III gives people plenty of chances to clap and holler. With a body count of 162, Rambo himself mows down at least 100 of those. Nearly everyone is a faceless extra stuck in a uniform. The plot never gets into politics. Russia is the invading force because that’s what Russia does (or did, anyway). 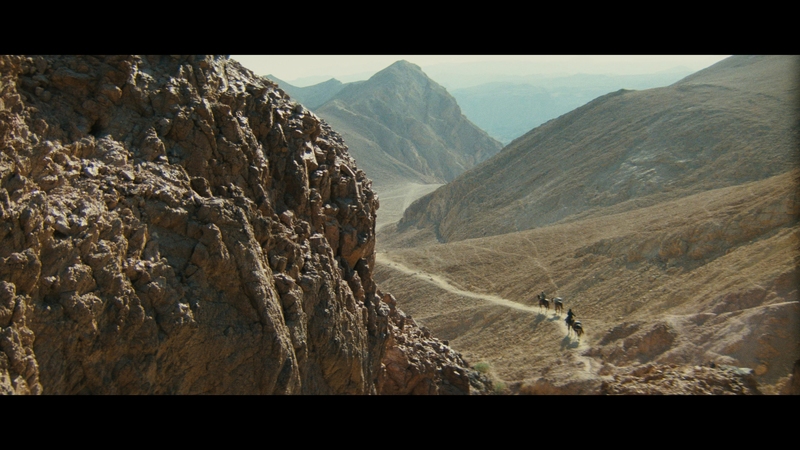 By Rambo III, cause became a lost art. A few rocket launchers, a helicopter or two, and lots of bodies – that’s the formula. Premiering on UHD, Rambo III comes with a new 4K master. It’s frequently gorgeous. Although source cinematography tends to jump between levels of softness, the frequent peaks in resolution deliver a high-end tier of sharpness. Fidelity and clarity enliven the scenery, pulling out small grains of sand even at distance. Skin texture and clothing look sensational. Lionsgate’s encode works with a mild grain structure. Compression holds back, even in difficult scenarios that see sand whipped up. Although black levels frequently miss their target, no artifacts slip by. Black levels that do hit their mark during nighttime shots do create a slightly pasted-on look. In daylight, that depth retains an organic appearance. Baking in the desert sun lets the HDR take hold too, jumping out with superlative brightness. Saturated primaries give life to the otherwise warmed over images. The local Afghani people wear plenty of color, enlivened by this new master. Flesh tones sit in place without errant grading. Plenty of blue skies rise over the hilly terrain, showing off beautiful horizons. 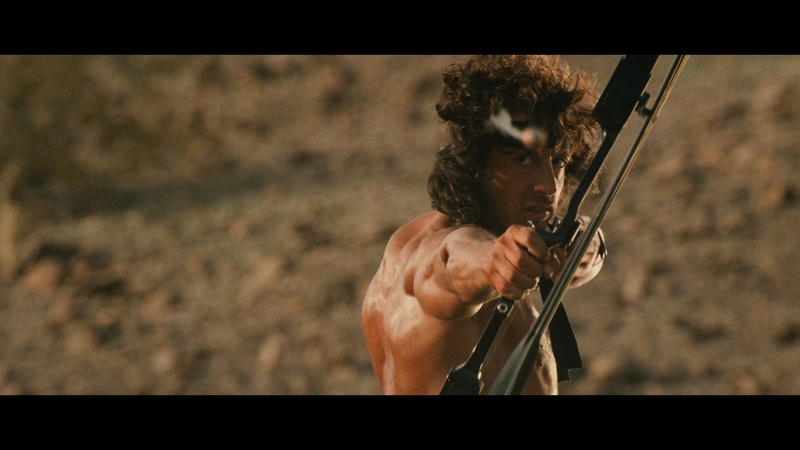 Paired with a DTS-HD 5.1 track, age gives Rambo III benefits over its predecessors. While low-end support remains loose, rumble effects add genuine weight to the mass of explosions. Even a few punches add low-end kick. Tank rounds during the finale sting too. The soundstage works great, adding positional cues naturally to these scaled up action scenes. Bullets ping between speakers and helicopters sweep between speakers fluidly. While stock sound effects do sound tinny, their presence in the soundstage adds width. Ambiance is high too. Helis swirl around when on bases and a busy Afghan marketplace spreads the crowd. Combined, this all adds depth to this now 30-year old action flick. On the UHD (and Blu-ray) director Peter MacDonald discusses his first project in this role. 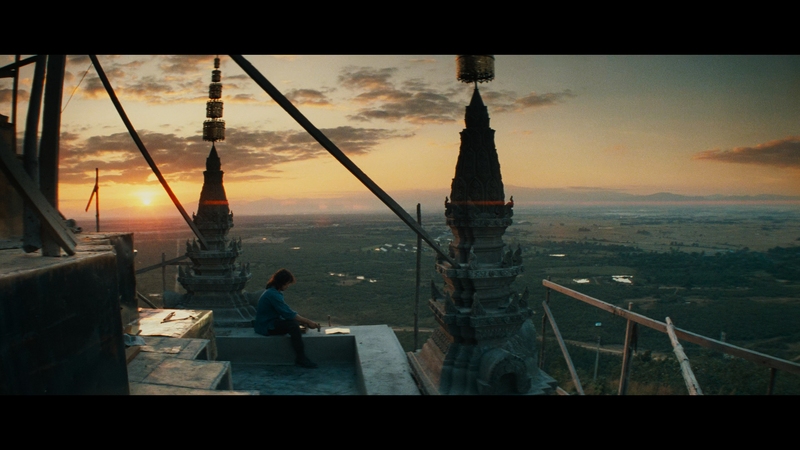 Everything else sits on the Blu-ray alone, beginning with the third part of the excellent Rambo Takes the ‘80s. The 11-minute retrospective is worth going through. A Hero’s Journey follows, a half-hour look at how Rambo changed as a character. Land in Crisis explores the reason for setting things in Afghanistan, another half-hour offering. 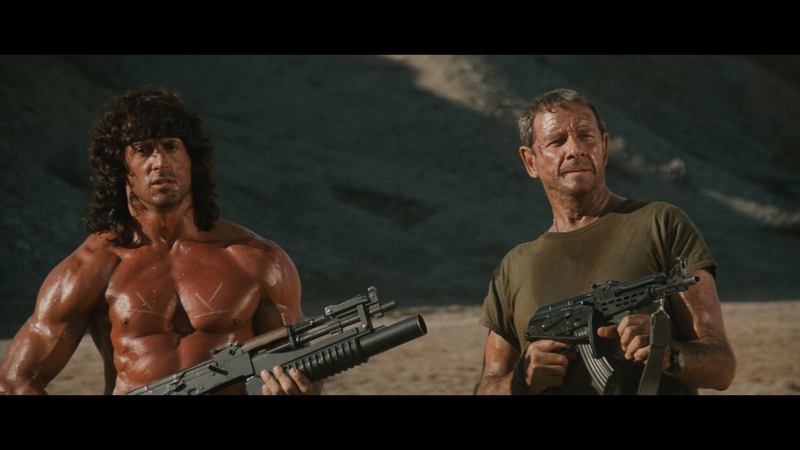 Up next, Guts and Glory, exploring the cultural impact of Rambo worldwide. Set aside yet another half-hour for this one. 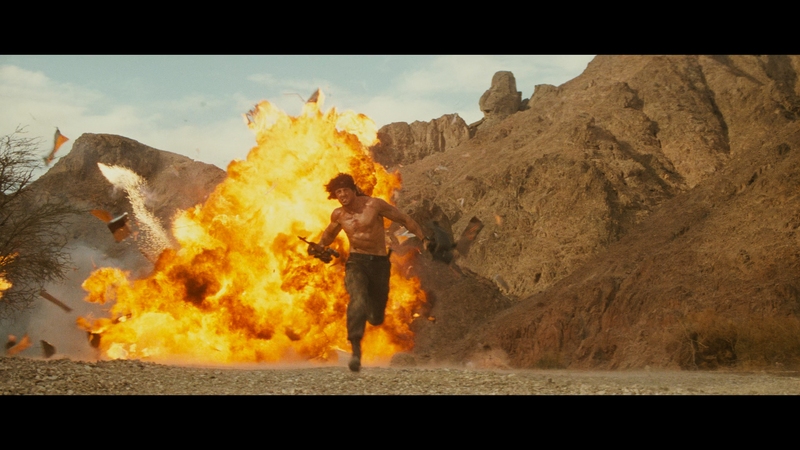 A hokey look at Rambo’s weapons and cruddy-looking action montage offer little value. An interview with Stallone is dated, and a few deleted scenes were wise cuts. A couple of news promos, a short look at the restoration, and workout video (so you too can look like Stallone) finish things up, aside from trailers. Idiotic, pandering, and culturally antiquated, at least Rambo III’s absurdist camp value hasn’t diminished its audience appeal.